This week’s instalment of the #SBIDinspire interior design series features the proverbial bar for one of chef Vivek Singh’s latest additions to the Cinnamon brand family. 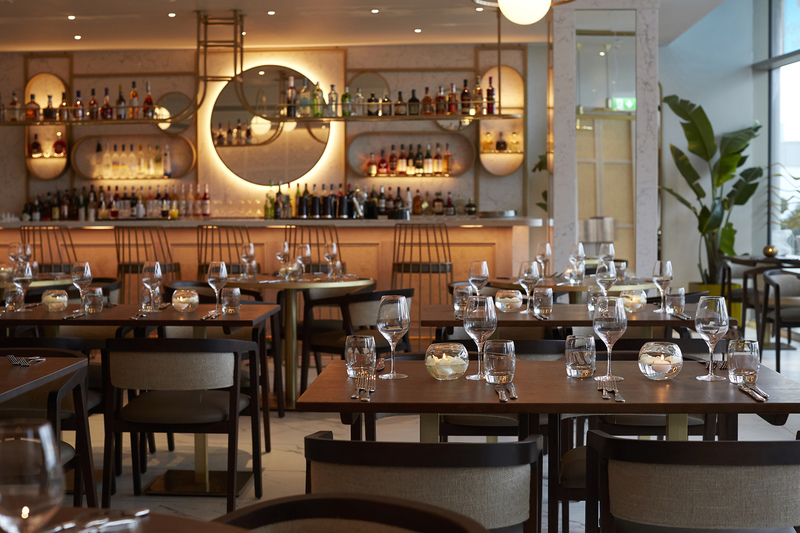 Cinnamon Kitchen in Oxford is his first restaurant outside of London and offers all day dining in a stunning setting. 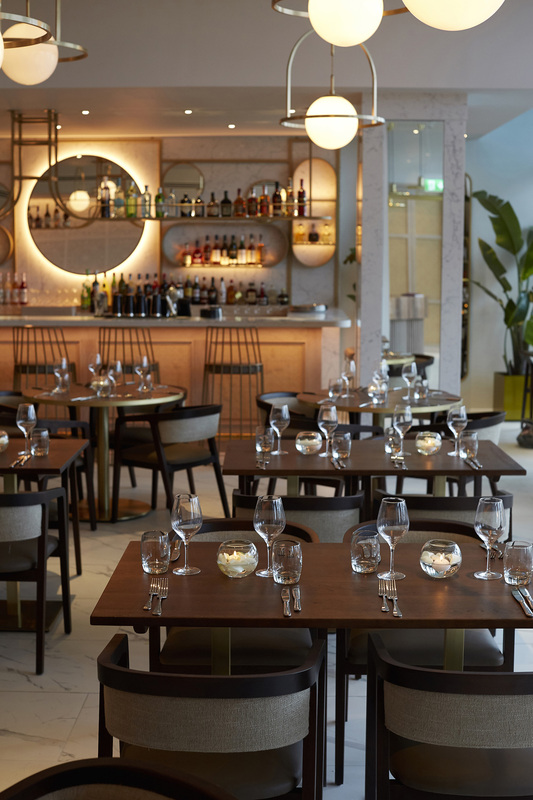 The sister restaurant was designed by DesignLSM, the hospitality design specialists behind the award-winning Cinnamon Bazaar and most recent launch of Cinnamon Kitchen Battersea Power Station. The decor combines a contemporary and pared back aesthetic with subtle elements reflecting the intricacy and elegance of Indian architecture. 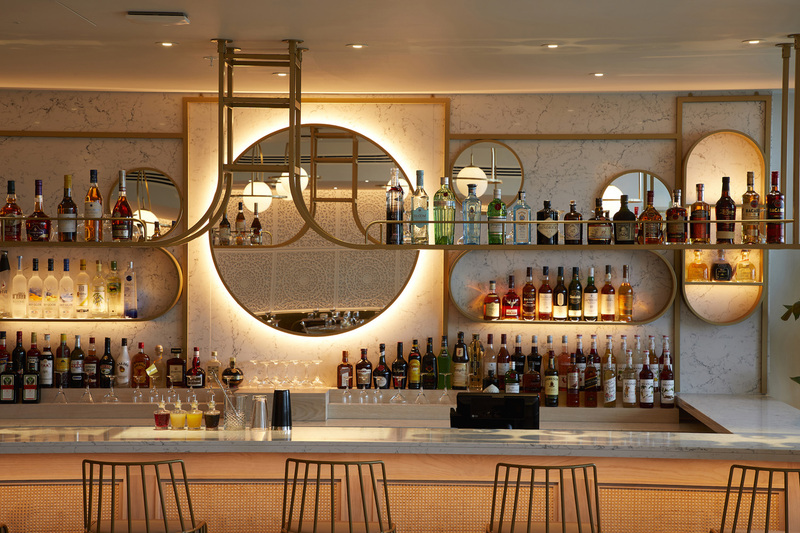 The new establishment includes a large destination bar on the ground floor, an openplan kitchen, chef’s table and a semi-private ‘Pagoda’ room. 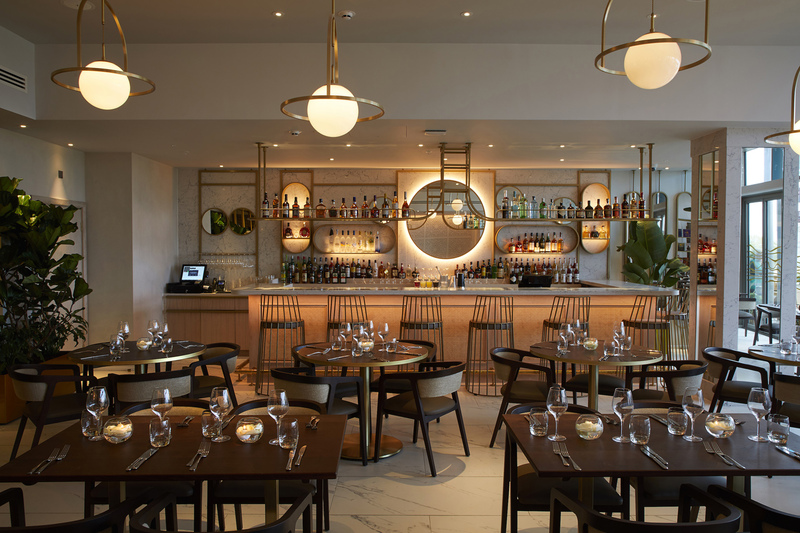 The 4,000 square foot restaurant serves modern-Indian cuisine with British influences. A focal feature is the impressive bar made from Caesarstone’s cutting-edge quartz surfaces; 5143 White Attica. Framing the space is a vibrant array of green ‘beetle’ style seating, creating a social and inviting setting for patrons to enjoy pre & post dinner cocktails. Our brief was to bring Chef Vivek Singh’s popular Cinnamon Kitchen brand to the city of Oxford, creating a relaxed all-day Indian dining destination on the rooftop gardens of the new Westgate shopping centre. 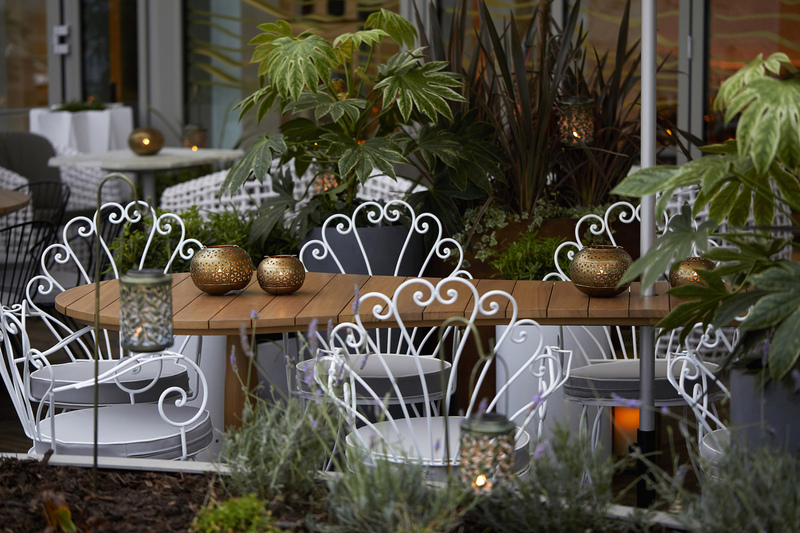 The restaurant offers a social and inviting setting complete with an exotic garden terrace, which allows diners to take in resplendent views of the City’s famous spires. 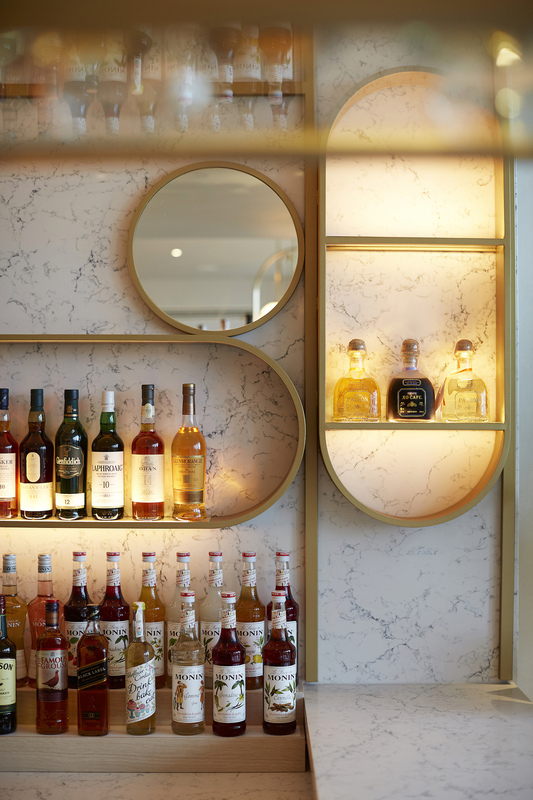 Inspired by the intricacy and elegancy of Indian architecture, the interior design combines a contemporary and paired back aesthetic – featuring decorative whitewashed wall paneling, bespoke pendant lighting and luxurious marble finishes; harmonizing together to create a refined ambience that strongly reflects the ethos of the Cinnamon brand. Despite the site being in a prominent location, it was important that we created a point of difference to other restaurant offerings within the area. We achieved this by designing an enticing outdoor terrace conjuring the exotic essence of an Indian garden with exquisite arrays of rich and greenery and relaxed alfresco furniture. Working with Vivek and the amazing Cinnamon team is always a joy, we have loved helping them expand their portfolio with their first debut outside of London; along with the openings of Cinnamon Bazaaar and Cinnamon Kitchen Battersea. This project was a great challenge for us to create a refined and elegant dining environment. Cinnamon Kitchen Oxford offers a different feel to its sister restaurant whilst still in keeping with the true persona of the brand. If you missed last week’s Project of the Week featuring the ideal destination designed to provide relaxation and entertainment for the residents of a prestigious development in Shanghai, click here to see more.